1. Rinse quinoa with cold water using a fine mesh strainer. 2. 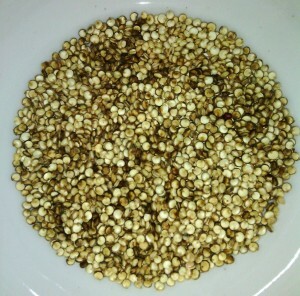 Spread the rinsed quinoa on a baking sheet and put in the oven on the lowest setting, stirring occasionally until dry. 3. Place a heavy bottomed pot over medium high heat. 4. Add 1 Tbsp. olive oil and swirl to cover the bottom of the pot. 5. Add 3 Tbsp. of the rinsed quinoa and cover the bottom of the pot evenly. 6. Place lid over pot and quinoa will begin popping. When popping slows, remove from pot and set aside. Quinoa burns easily, so be sure to remove quickly. 8. Wipe out the pot and repeat the process until you have popped the desired amount of quinoa.